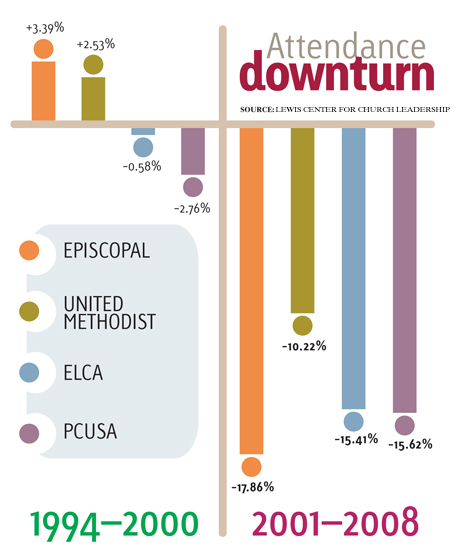 An interesting article from The Christian Century regarding worship attendance trends in mainline denominations. Entry into this emerging, postmodern world is going to be tough on mainline denoms. If there was one negative thing that resulted from the reformation, it was the disagreement between groups that led to an increasingly splintered Christian landscape. The postmodern reformation has a chance to reverse that as churches pull toward a center of creed-based faith. I don’t think any of the mainline denoms are doomed to the point of extinction. Someone will always be there to keep the ship afloat. But a look at the landscape of Europe, particularly England, can give a glimpse of the future in the US. The Church of England still exists, but it’s just a relic. More foot traffic is generated for being a museum than being a place of worship and spirituality. It’s similar to the Blockbuster – Redbox/Netflix situation. Blockbuster is bankrupt. Redbox and Netflix are the competition. The are a new breed in the movie rental game: innovative, creative, simple, flexible, user-friendly, and adaptable. New expressions of church are the Redbox/Netflix to the denominations Blockbuster. All Delighted People is built around two different versions of Sufjan’s long-form epic ballad “All Delighted People,” a dramatic homage to the Apocalypse, existential ennui, and Paul Simon’s “Sounds of Silence.” Sounds delightful, yes! The song was originally workshopped on Sufjan’s previous tour in the fall of 2009. Other songs on the EP include the 17-minute guitar jam-for-single-mothers “Djohariah,” and the gothic piano ballad “The Owl and the Tanager,” a live-show mainstay (and Debbie Downer if you ask us; what’s it doing on a “Delighted” EP?). Would you show this pic in church? It’s disturbing and could frighten children, argue church elders, who declined to display it in the church’s art gallery alongside the work of other artists depicting the remaining 14 stations (the 15th depicts Christ’s resurrection). There is a fine line between the sacred and profane. In my opinion, even the most profane piece of art is by it’s very nature showcasing the creative nature of God. We are created in God’s image – as creative beings. So any creative output (even the most blasphemous) is reflective of the creative nature of God. I understand the leadership’s decision: they placed the children’s mental safety and ability to process art over the artistic expression. It was an editorial decision. But is that decision reflective of the Gospel and the Kingdom of God? Is being a disciple and citizen of the Kingdom always easy and safe? Is child abuse horrendous? Yes. Was Christ’s brutal death (sacrifice) any less horrendous? No. Is there room for “art for art’s sake” in the church? Does your church take design seriously (architecture, worship, long range planning, etc.)? Does your church offer guest-friendly “try before you buy” environments? Is your church’s view of the world present in how you design worship? Does your church welcome the question “Why is it like that?” around the subject of worship? How much attention is paid to how people physically connect to your church? Can your church fulfill it’s mission in 1 step instead of 6? How much does your church talk about process (instead of product)? Is the hierarchy of importance easily discernable in your church? I think it’s time we saw that the world has changed and what we know how to do — Sunday liturgies, capable preaching, Sunday ministries of teaching and welcoming — stopped being enough many years ago. In drifting away from church, you see, people aren’t saying no to God or to faith. They are saying no to Sunday church. They do so for a variety of reasons. For some two-income families and hard-charging young adults, Sunday is the one day to get a slow start. Audience-style worship is too passive for a Web 2.0 world that is customer-centric and transactional. • Sunday on-site: Sunday worship, Sunday education, fellowship (e.g. coffee hour). • Weekday on-site: Weekday suppers, education programs, mission work, volunteering. • Regional gatherings: Neighborhood assemblies, workplace and other targeted interest groups. 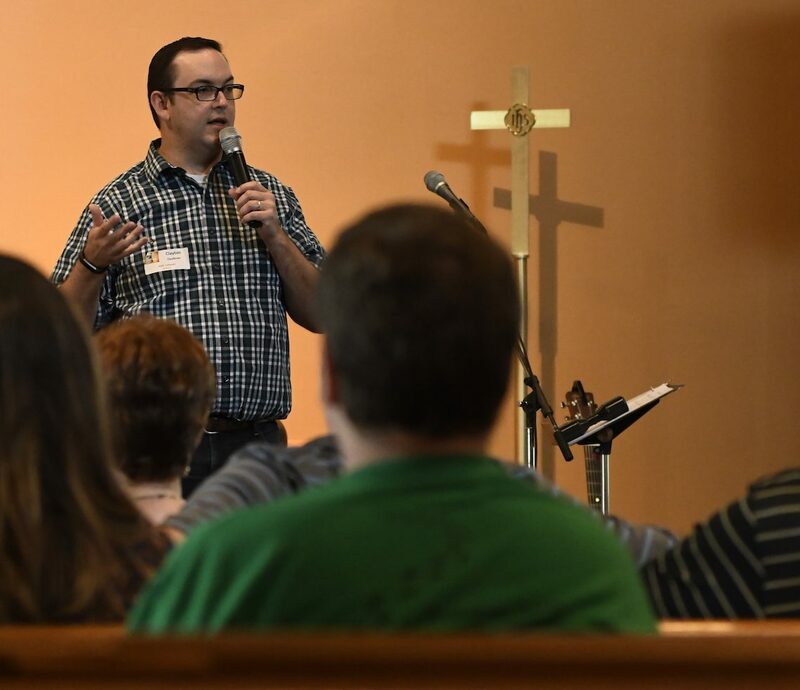 Larger congregations will have multiple sites for all that they do, including Sunday worship. Medium and small churches will have satellite centers for weekday community-building, but worship at the central site on Sunday. • Home gatherings: Small groups, including informal devotion and prayer. • Personal spirituality: 24/7 access, self-determining, using classic devotional tools, Web-delivered content and personal ingenuity. • Virtual community: Blogs, discussion groups, chats, polls, social networking, Q&A venue. • Special community events: One-time events that facilitate mass participation by the entire congregation, with a focus on forming identity. • Published word: Possibilities include magazine, self-published books, shared journals and homegrown devotionals. • E-mail marketing: Strong use of e-mail to market opportunities, to draw people to the Web site, to facilitate sharing with non-church friends, and to promote transactions such as registering for an event. Switchfoot covers one of the best pop songs ever written (in my opinion). Feel free to keep investing in print communications if your highest priority is keeping your “internal customers” happy. Just thought you should know that other organizations are using the web to reach the same people you’re probably trying to reach in your community. So what else does your church do to keep “internal customers” happy, but misses reaching out to new people?